The Bhāvana Program is a seven-day vipassanā retreat of sitting and walking practice which includes a textual study session each morning. 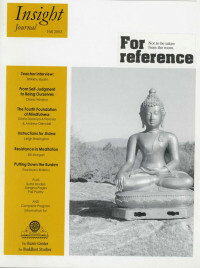 This new model, unique to BCBS, allows for an in-depth investigation of the Dhamma using both intellectual and meditative tools of inquiry. It is usually co-taught by a meditation teacher and a scholar. The fourth foundation of mindfulness has to do with “contemplating dhamma as dhamma,” and how this phrase is understood becomes pivotal to its practice. The word “dhamma” is often used in two very different senses, and I would like to suggest a way of using this ambiguity to great advantage when practicing insight meditation as a form of reflection on the nature of experience. However, the interpretation I find most effective involves putting these two meanings of the word together to get “contemplating the Dhamma in the dhammas.” This means we are endeavoring to be mindful of, to consider, the Dhamma or Truth in the phenomena of experience. This is contemplation of phenomena in such a way as to bring insight into the fundamental principles of the Buddhist teachings. It is reflection for the purpose of insight. We are directing the observing power of the mind in order to see for ourselves what the Buddha taught. We can actually learn to see the Dhamma (the truth of the teaching) in the dhammas (all arising and passing phenomena). In this section of the Satipaṭṭhāna Sutta there are five groupings for contemplation: the five hindrances that are to be overcome, the five aggregates of clinging, the six internal and external sense bases, the seven factors of enlightenment, and the four noble truths. These are the things the Buddha is inviting us to contemplate and to have insight into. He is pointing us in such a way that we can see these processes for ourselves, in our own unfolding experience. All four of the foundations of mindfulness actually do this, but here in the fourth we are clearly bringing in the factor of recollecting or reflecting. Moving beyond mere mindfulness, we are guided through a way of putting things together in our minds so that we make sense of what is going on. Let’s look for a moment at the difference between the first three foundations of mindfulness and this fourth one. With the first three we are endeavoring to have a direct experience of body, of feeling and of mind without adding anything. We want to be able to just see these experiences as they are. This is no easy task. In order to do this we have to override an incredibly powerful propensity for thinking about things. We easily get caught up in our experience of sensa­tion, feeling and thought, and we proliferate endlessly around our experience at these levels. So the effort is to back off and develop a new relationship with them. We develop the capacity to pull out of identification, to objectify or detach enough to be with the experience in and of itself. If we can do this, it is a huge step. From this vantage point of greater non-attachment, we are well-positioned for insight. Now the fourth foundation of mindfulness introduces another level of sophistication. We no longer look at just what goes on in the body, just what feeling is occurring, or just at the various states of mind that arise—we actually begin to examine the whole process going on around these. We look at the process of getting caught up, a process of suffering. With the fourth foundation of mindfulness we see more clearly how we get identified with experience. We derive first hand understanding of how states come up, what makes them stick around, how they go away, and how to keep them from coming up again. We notice what is skillful and what is not. We start to understand for ourselves when there is suffering, how it is that we suffer, and where that suffering is rooted. This moves our investigation up a notch, to a higher order of discernment. One could say that with this fourth foundation of mindfulness we’re bringing reflective thought more fully into the picture and using it in the interest of our own understanding and freedom. I find this fascinating. The mind has the capacity, and as far as we know it’s uniquely human, to turn around and observe itself. What are we doing when we’re sitting here meditating? The mind is looking at the mind. The body can’t do that. The eye can’t see itself. The ear can’t hear itself. But the mind can know itself. In this teaching on the fourth foundation of mindfulness I hear the Buddha inviting us to recognize that we have this capacity, and to use it for the optimal purpose we possibly can, which is to get free. It’s as if the Buddha is saying, “Look and see and understand. Garner the wisdom from your own direct observation, so that you can learn what I learned.” And when we use this reflective capacity to discern things for ourselves, these “ah-ha” moments arise in our practice. The ability to reflect upon experience is something we don’t really use as confidently or even as consciously as I think we could. Maybe we haven’t evolved enough yet, or maybe it has to do with some sort of cultural limitation. But it seems that this reflective capacity is often operating somewhere just below the level of our awareness, even if we do not acknowl­edge it. The mind is always putting things together, figuring things out, but we so often don’t notice it as the useful process that it is. I think with this instruction on the fourth foundation of mindfulness the Buddha is trying to get us to make this reflective capacity more conscious so that insights can be more forthcoming. How do we allow reflective thought into practice? First, it is crucial to distinguish what I’m calling reflective thought from the more common discursive thought. Reflective thought actually has a slight investigative quality to it. The mind is reflecting on experience. It even pokes around at it. The mind is interested, cogitating. It’s wanting to figure out what is happening. Discursive thinking operates in another, more chaotic way. It’s this tendency of the mind to just pick something up, play with it for a period of time, mull it about, and then put it down—either because something else more interesting comes along or because it’s gotten tired of playing with it. Then it will pick up something else. It has no discrimination or discernment in this regard, and the picking up and putting down is going on virtually all the time. If we follow this stream of compul­sive thinking, then it’s as if we’re living in a dream state. The mind is just moving from one thing to another to another to another to another, and not really discriminating in any way as to what is useful and what is not. These are just the voices inside our heads, chattering away when we sit in medita­tion or walk around throughout the day. And, as I’m sure you’ve seen, this discursive thought is usually free of any useful content. All the compulsive chatter could stop and we would not have lost much—except maybe a lot of agitation. With the first three foundations of mindfulness we are trying to calm this activity and see things in-and-of themselves without all the commentary. We are trying to at least diminish if not suspend for a period of time this crazy way of being with sensation, feeling, and thought. If you are having a truly mindful experience of any of these, then thinking about the experience is not going on in the same moment. The capacity for reflective or contemplative thought is the ability to look at things and reflect upon what is happening. It allows us to ponder our experience, to consider it, to look at things from different angles. The mind is trying to get at the nature of what it is that one is observing. We are using the capacity of mind that is constantly looking for patterns in things and trying to figure things out, to put things together, to understand. And as it is applied in this fourth foundation of mindfulness, it forms the basis of insight. You probably see this a lot in sitting practice, or even just throughout the course of a day. The mind is constantly trying to find patterns in things, to find a certain order in things. This is natural. With the fourth founda­tion of mindfulness we are turning this capacity for discerning toward the things that are useful and important: toward understanding, toward our own freedom. We are using reflection to sort out the inner workings of the mind and, more precisely, how we get into suffering and how we get out of it. Really it is no less than that. I love this aspect of the teaching. It’s as if the Buddha is saying, “Don’t be afraid of using the mind to develop wisdom.” What I find more unusual is that the use of reflective thought as it is being described here is not often included in meditation instructions. Rarely are we instructed to reflect on what’s happening. It’s as if there is a subtle implication that there is some­thing wrong with thinking. Boy, if there’s something wrong with it we’re in big trouble, because we sure think a lot! And if we think there is something wrong with thought we are likely to go to war with thoughts—and this is not helpful. It just gets us more tangled. Consider this: What if there is nothing wrong with thought? Just because some thoughts can be obsessive or shallow or can block the immediacy of mindful awareness, that does not mean that all thinking is to be shunned. We simply want to discern what kind of thought is helpful, and whether or not it’s being turned to a useful purpose. We want to relate appropriately to thought. The fourth foundation of mindful­ness is like an invitation to look when you’re sitting, to look and see: is there a part of your experience that knows what is happening and that is evaluating it and putting it together according to Dhamma? This is not an unfamiliar capacity at all. Everyone knows exactly what I’m talking about. The purpose of this foundation of mindfulness is to make us more aware that the mind is already reflecting, and to use this capacity more effectively. Let’s not put thought outside the meditation process. You are already thinking, so make it more conscious and turn it towards things that are useful. But be sure you know how to do it so you don’t get caught up in a lot of compulsive thinking. I would go so far as to say, if you’re hesitant or just unsure of this, dare to risk getting caught up in some discursive thought to figure out what it is that we’re talking about. Just dare to try that out. But it is not like we are entirely without guidance in this process of reflecting upon experience. In the Satipaṭṭhāna Sutta the instructions on the fourth foundation of mindfulness takes up more than half of the text! So it’s a very significant part of mind training. The Buddha is pointing us towards several things to contemplate, and guides us through it step by step. When we actually take the time to go through these instructions with care, no less than the entire Dhamma opens up to us in the contemplation of dhammas. And this is what we will spend the rest of the week doing—step by step. We will begin to see the Dhamma in the dhammas.